One of the smallest hill stations in the Himalayan foothills, Chail is an idyllic destination for nature lovers and is popular with birdwatchers. Lying at a height of 2,250 metres above sea level, this picturesque lush green hill station is located 43 km South East of Shimla, the capital of the state of Himachal Pradesh. Chail, a rural hamlet was made the summer capital by the erstwhile ruler of Punjab (Patiala State) Maharaja Bhupinder Singh, after he was expelled by the British in 1891 from Shimla, the summer capital of the British Raj. The Royal House of Patiala, always known for their tasteful and opulent style, made the place a royal retreat; building a palace, hunting and fishing lodges, cricket and golf grounds for their comfort. Chail is set amidst thickly wooded pine and deodar forests with snow-capped Shivalik ranges in the background. It is built on three hills - 'Rajgarh Hill' topped by the Chail Palace, 'Sadh Tiba hill' by the village itself, and 'Pandhewa Hill' by the Snow View Mansion. Shimla and Kasauli, the two other major hill stations in Himachal Pradesh, are visible from here. Chail became accessible to tourists after the Pataila royals handed over the 75-acre Chail palace to the government in 1972. The beautiful forests and valleys, the river Sutlej winding its way down the Shivalik ranges and the tranquility of the hill station as compared to Shimla, make it a favourite destination for hikers, nature lovers and honeymooners. Chail also provides good opportunities for fishing and trekking. The old palace on Rajgarh Hill with its elaborate furnishings, comfortable log huts and cottages, dense forests and serene walks, sprawling lawns, children's park, lover's hill and adventure sport facilities make a visit to Chail memorable. Promoted as a premium heritage hotel by Himachal Pradesh Tourism Development Corporation, the Chail Palace also known as Maharaja's palace surrounded by deodars and pines, is an enchanting site. The palace is an exquisite example of Indian and British architecture, built by Maharaja Bhupinder Singh when he was expelled from Shimla by the Britisher's in 1891. Set in approximately 75 acres of land, this magnificent palace was purchased by the State Government of Himachal Pradesh in 1972 and now is promoted as a premium heritage hotel. 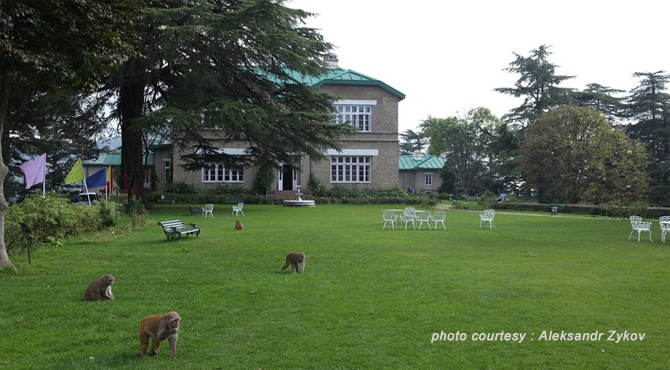 Surrounded by spacious lawns and gardens the palace has picturesque cottages and huts for tourists. It has three very spacious cottages, namely Rajgarh, Monal and Wood Rose. The hotel also boasts a children's park, badminton and tennis court, billiard room and a conference room. At 8,000 ft, the highest point in the area from downtown Chail, Sidh Baba Ka Mandir (1.5 km) is situated on a hill between Rajgarh and Pandhawa. A belief of the rural people of Chail is that Sidh Baba is the protector of prosperity of Chail. There is a legend behind this temple that, the original site for the Maharaja's palace was here, but a saint appeared in Maharaja's dreams telling him to select some other site as this was the place where he had meditated. Raja Bhupinder Singh shifted the venue of the palace and built a temple on the spot. The temple is a simple, traditional structure. Built in 1893, the cricket ground located at an altitude of 2,144m, 3kms from Chail is the highest cricket ground in the world. The ground with beautiful and tall deodar trees and pine surrounding it, is a picturesque site. The well -kept ground with manicured lawns has a small stadium. The pitch serves as a venue for polo matches and also a play ground for the students of the military school nearby. Spread over an area of 10,854.36 hectares, the sanctuary stretches from the Krishna River to Giriganga River. Set up in 1976, the park comprises Deodar and Oak forests with grasslands. The fauna found in the sanctuary are Sambar, Goral, Himalayan Black Bear, Red Deer, Silver-White Oak, Barking Deer, Indian Hare Common Langur, Leopard, Rhesus Macaque, Himalayan Yellow Throated Marten, Indian Porcupine, Common Giant and Kashmiri Flying Squirrel etc. There is also a large collection of birds. One of the oldest skiing places in India, Kufri at an altitude of 2,510 m above sea level is another scenic place near Chail. The place is a paradise for adventure seekers and it is the focal point of a large number of ski enthusiasts. It's main attractions are the Himalayan Nature Park which has a collection of animals and birds, the Tara Devi temple on top of a hill, and the exciting trek and horse rides that leads to the divine Mahasu peak with its slopes perfect for skiing. Normally, areas in Kufri receive snowfall around Christmas and New Year. A small village lying at an altitude of 1,360 m, halfway between Kandaghat and Chail. The bridge over the Ashwani stream here makes this place a popular picnic spot.